I love the smell of fresh baked bread. It always cheers me up and takes me back in time in my grandma’s kitchen. How many sweet memories… I love to bake and there’s no secret in it. Since I’ve been playing with my sourdough starter I became curious and read a bit more about all sorts of bread and my curiosity led me to try them at home. Pita breads have been on my to do list for a while now and last week I found the courage to give it a try following Emmanuel Hadjiandreou’s method from his book How to make bread, a book I was talking about here, a book which I recommend to all the bread baking lovers all over the world . The result was amazing that’s why I decided to share it with you. In a small mixing bowl mix the flour with the salt. In a larger bowl dissolve the yeast in the warm water. Mix the mixtures together with a wooden spoon at the beginning and then with your hands until a dough is formed. Cover the bowl and let the dough stand for 10′. Knead the dough gently, pulling a portion of the dough up fron the side and pressing it into the middle. Turn the bowl slightly and repeat this process with another portion of dough. Go on with this for another 8 times. Cover the bowl again and let stand for another 10′. Repeat the kneading and resting steps twice then the kneading step again. Cover the bowl and let rise for an hour until the dough doubles in volume. Punch the dough down to release the air. Dust the work surface with flour. Remove the dough from the bowl and place it on the floured surface. 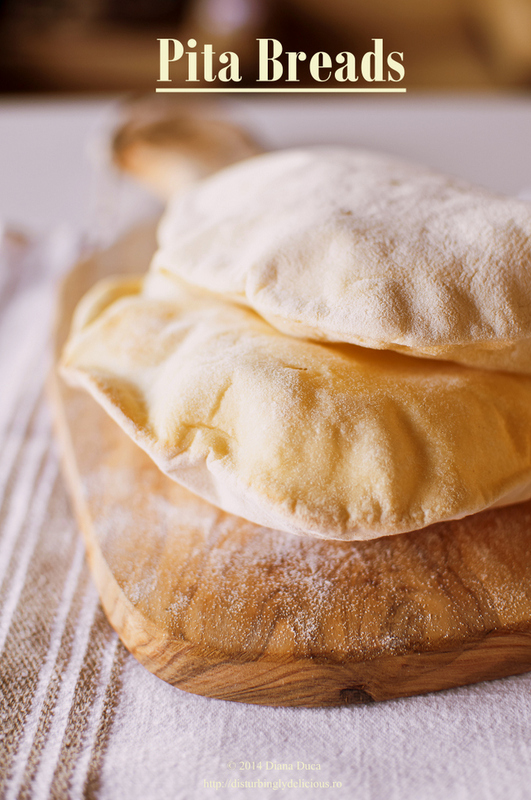 Divide the dough into 8 – 10 equal portions giving them a ball shape; cover and let rest for 10′. Preheat the oven to 240°C and place a roasting pan or a baking tray on the middle rack to preheat. 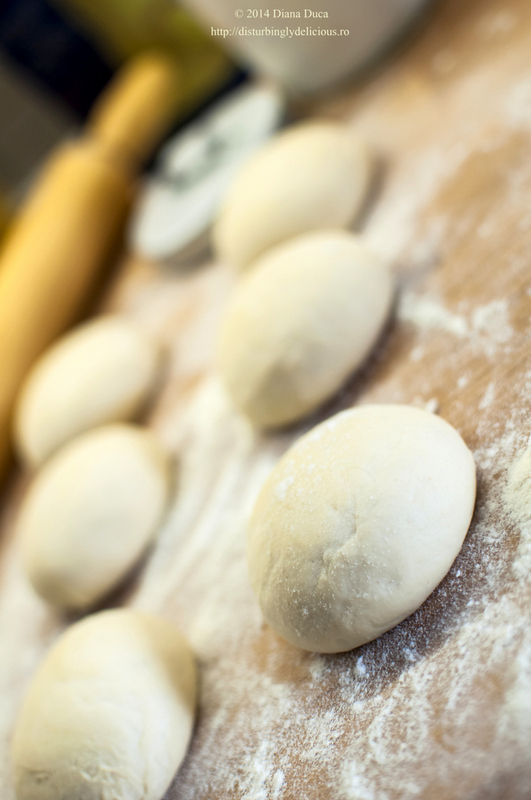 Roll out each dough with a rolling pin. Cover and let rise for 10′. When the dough has finished rising dust the pita breads with flour and place on the preheated tray. Bake until completely puffed up. 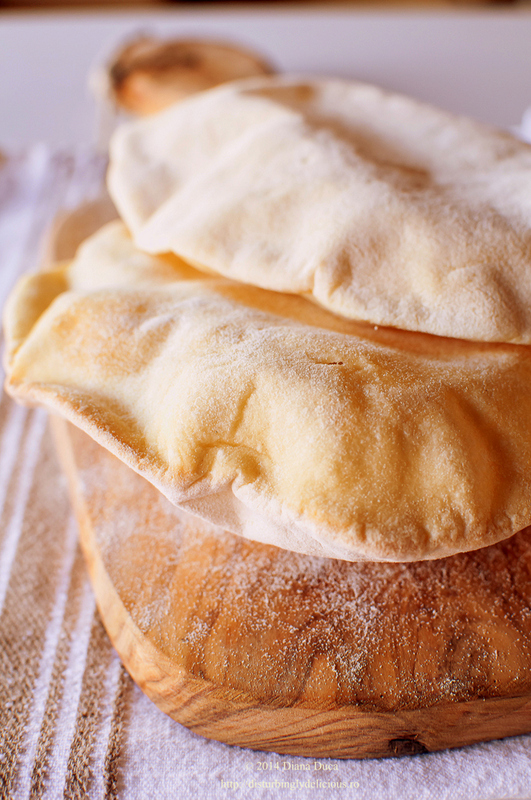 Let the pita breads to cool slightly then place them in a food bag to avoid them drying out. It was so exciting to see the breads puffing up in no time in the oven making perfect pockets to stuff with all sorts of delicious fillings. We had ours filled with grilled chicken breast, feta cheese, salad and a Greek yogurt dressing ( no photos as we were too hungry to take a picture ). Hugs and kisses from Milan! Acum știu unde găsesc o rețetă bună de lipii! Multumim pentru reteta! De mult timp caut o reteta de pita care chiar sa functioneze! Abia astept sa le fac! nu imi pot lua ochii de la fotografii. ador stilul tau! Era o vreme cand fugeam de aluaturi,intre timp mi-am dat seama ca nimic nu se compara cu painea facuta in casa..